United Heritage Insurance started in the 1930s under the name of Grange Mutual Life. Specializing in the design and sale of quality insurance products, the company strives to be service-conscious and maintain a strong financial position for the benefit of policyholders, agents, employees, and stakeholders. The company’s IT department began using an IBM System/38 in the early 1980s and then migrated to the IBM AS/400. They currently have C++ and C# client applications that talk to RPG server programs with Db2 serving as the database. 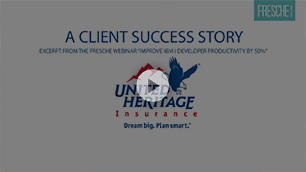 Since starting with the System/38, United Heritage has created significant amounts of code, much of which runs today without upgrade due to IBM’s commitment to backward compatibility. This situation has always allowed United Heritage to move forward and focus its time on new development, but it also resulted in older programs continuing to run as long as they didn’t break. This older code became an issue when United Heritage sought to become more agile. With code created in the mid-1980s still running on the system, modernization became a major priority. Onboarding new IT employees — especially millennials — was also a concern, as experienced staff were nearing retirement. How to ensure business continuity, particularly with certain complex programs that were no longer well-understood? United Heritage immediately replaced its older, green screen cross-referencing tool with X-Analysis and X-Datatest. The X-Analysis Data Model Diagram feature enabled Rob’s team to see all of their applications and data structures at once. X-Analysis also displayed which files fed into other files, highlighted data flows and identified programs required for testing. Rob McBride and his developers are finding new ways to profit from X-Analysis and Fresche services. Using X-Analysis, a Fresche consultant analyzed and quickly began updating United Heritage code that contained move low zones, multi-record formats, matching records, cycle processing, GOTO statements and numbered indicators 1-99, some of them multiple times in the same program. And Rob himself has come to appreciate X-Analysis’ powerful impact analysis capabilities. With the picture provided by X-Analysis solutions, the road ahead is clear for United Heritage.